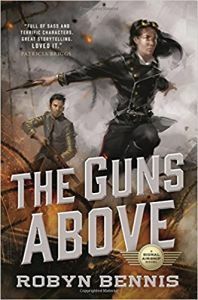 It’s airships and rifles in a kind of Napoleonic-era war in the steampunkish debut novel The Guns Above by Robyn Bennis. Other than the steam engines mounted on the airships and the mention of trains, there’s little of the traditional Victorian steampunk ethos in this book. But there’s plenty of adventure, grittiness and sarcastic comments.